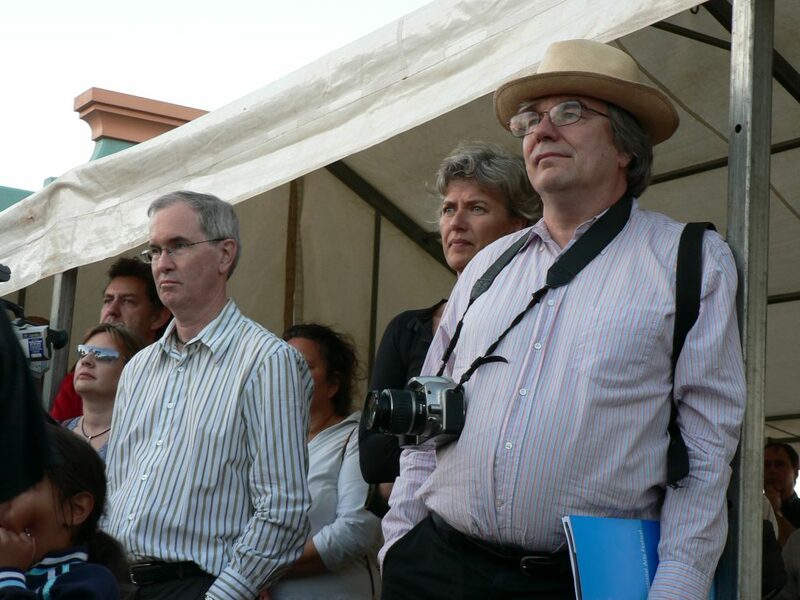 John Stanton (Berndt Museum) [Left Front] with Howard Morphy (Australian National University), who discovered the ‘lost’ works at Colgate University, watch the Official Opening of the ‘Koorah Coolingah’ exhibition at Katanning Art Gallery, 24th February 2006. Berndt Museum of Anthropology, The University of Western Australia. Colgate University in up-state New York seemed a very long way, and a very long time ago, as Howard and I watched the Opening Ceremony at Katanning, a welcome homecoming to the 20 artworks that had been loaned by the Picker Gallery to the Perth International Arts Festival (PIAF) for the ‘Koorah Coolingah’ exhibition at Katanning Art Gallery. It was Howard Morphy who had immediately rung me from Hamilton, New York, the evening he had identified the artworks by the Carrolup child artists almost two years earlier. A friend and colleague from the Australian National University, Canberra, Howard had been visiting Colgate University to give a public lecture. Now, standing at the back of the Katanning crowd, on 24th February 2006, we both felt overwhelmed to share in the excitement of the Noongar community being able to give these precious artworks an appropriate welcome homecoming back to the South-West, to Noongar boodja. This was indeed a special day for the Noongar people of the South-West; Howard and I felt humbled in our respective roles of helping to bring about this homecoming. The child artists of Carrolup ignited a flame, a flame that still burns—a flame that is embodied by the ritual burning of a balga, a grass tree, at the end of the Official Opening. We were all told that this symbolised survival, rebirth, and new beginnings.